So, we had a boardgame night last night, and it was absolutely fantastic. I've been to good board game nights before, but the games we played last night were top notch. This game is incredible mostly for a single game mechanic. The standard game plays a lot like Sid Meier's Civilization game. 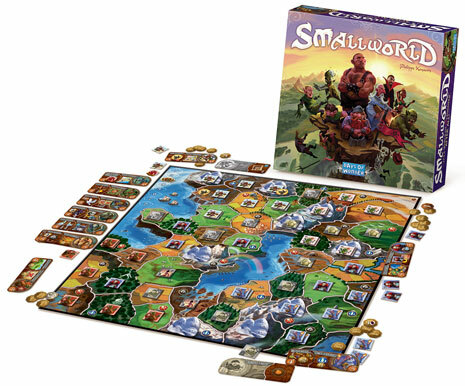 Each player takes on the role of a mythic race that spreads across the land through conquest of territory. At any time during the game, when you feel the race has run its course or cannot possibly win against a larger force, you have the option of declaring the race's decline. When this happens, you displace one civilization and pick up another one, which you begin and expand anew. After nine turns, the game is over. Mix this with a myriad of different skill types you can attach to a single race, one discovers that the races themselves can be different in the way they are able to conquer the lands. This game is great to play, but it could serve another role. A GM who wanted to create a random history for world generation could use this game as a valuable tool. The races played at the beginning are random as are their abilities, so the "history" could play out in any different number of ways. I might actually be getting this game for that purpose. Next up: Dungeons and Dragons: Return to Castle Ravenloft. Great games. Great game night.